Our one-day specialist joins us 100 days ahead of the 2015 World Cup. It's 100 days to go until the start of the 2015 Cricket World Cup - and to mark the start of the countdown proper Nick Knight has joined us to answer you questions, which you can pose by tweeting @SkyCricket using the hashtag #askSkyCricket. Hi Nick. Who do you think are the favourites to win? And which team do you think will be the surprise package (if there is one)? If you are going to ask me for one team to win, I would say Australia. 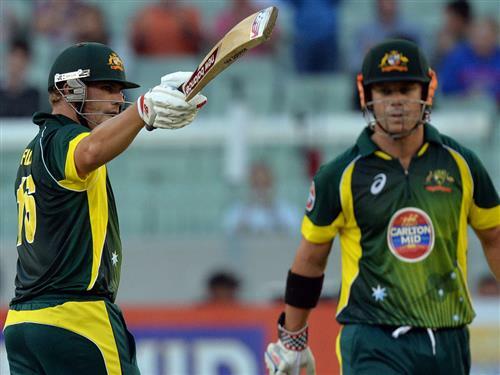 I think they have a great depth of squad and see Finch and Warner as an outstanding partnership at the top of the order. Add in the class of Watson and the potency of Mitchell Johnson and they are hard to look past. I have always looked at the spin option as a potential area where you can expose Australia, though. They don't have the brilliant Warne of yesteryear and a high-quality spinner would be great for them. I say that because the bounce of the spin in Australia creates a lot of problems, even on flat pitches. It won't be a case of spin being less important because we are not in the subcontinent. As far as surprise packages go, it's New Zealand, particularly in home conditions. You'd fancy them to get through the group and win a quarter-final but a semi or a final? I'm not sure. For them it depends on Jesse Ryder. He is a high-quality game-changer with the bat, as we saw from his time at Essex, and his bowling is coming along. He can perform a dual role. If Ryder desperately wants to play for New Zealand and make an impact in a World Cup, then, crikey, he will be a real asset. So will Tim Southee on the bowling front. How far do you think Pakistan will go? I am going to come out with the greatest cricketing cliche and say you never know. I have a concern over whether they will rack up enough runs with the bat but we know on the bowling front that they have the firepower. Junaid Khan is majestic at the death and even without Saeed Ajmal, they have magic. What are your thoughts about the defending champions India?? What are there chances??? I still think they will be right up there, though. Virat Kohli, despite having a lean time in England, is the outstanding one-day batsman of the moment and MS Dhoni is a marvellous captain. India - can they defend their title in Australia and New Zealand? Dhoni is very feared with the bat and has the ability to stay cool at crunch times. I love watching him captain and think he is India's greatest strength. India's bowlers caused England all sorts of trouble this summer. Kumar has a lot of control of the swinging ball and if he stays fit I think he can have a major impact. what do you think of Englands chances? Hi Nick, what can cricket learn from the football and rugby World Cups? What is your favourite moment from a World Cup? Who is the best left-handed batsman we will see in the World Cup?